The shady start of the trail. Wouldn't this be a perfect place for a house? 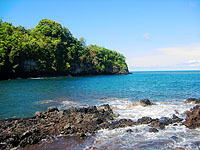 This delightful and short hike descends 600 feet from the Scenic Drive to Onomea Bay. Once the site of a Hawaiian Village, this hike takes you down an old donkey trail to the ocean and Onomea Bay where you have a spectacular 180 degree view of cliffs, the ocean and portions of the Hāmākua Coast. 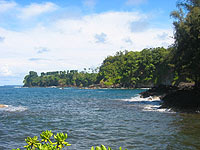 The Onomea Bay Donkey Trail Hike is found 1.75 miles from the Hilo side of the Onomea Bay Scenic Drive. 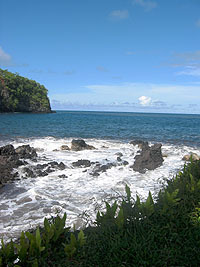 When traveling from Hilo, up the Hāmākua Coast, the Scenic Drive is at about the 7.5 mile marker along Highway 19. The start of the Scenic Drive is a right hand turn from the Highway and is well marked. 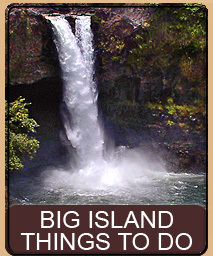 Continuing on the Scenic Drive about 1.5 miles will take you to the Hawai'i Tropical Botanical Garden. Continue past the Garden parking lot paying attention to the right part of the road. Just past the Gardens gate and end of the fencing you will see a small sign and a rough trail descending down the right side of the road. That is the trail. The best place to park is to continue past the Garden on the Scenic Drive, and past the trailhead. A short distance after the curve in the road, on the right side, you will see a small pullover area about big enough for two or three cars. We recommend parking at this spot (take care not to leave valuables in plain sight). Walk back along the road to the trailhead and descend down. You may wish to read the Onomea Scenic Drive review to get more information about what can be found along this spectacular drive. This is a short hike, about 1200 feet round trip. You return the same way you descend, however, returning is far more difficult as it is somewhat steep and thus a bit of a climb. Thankfully it is a short climb. 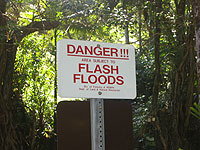 Do NOT take this hike if it is raining, or if it has rained heavily for the last 24 hours. It is preferable to have a beautiful, sunny day for this hike. The hike down to the bay follows a dry (on dry days) streambed. The rocks when damp can be slippery. Avoid stepping on rocks with green moss as the moss is VERY slippery. Passing the Botanical Garden, and parking at the spot we recommend above (if you can't find parking at the spot we recommend, you may find some just before the Botanical Garden, or a bit after where we recommend. Do not, however, park at the Botanical Garden itself unless you intend to visit the Garden). Walk back along the roadway towards the trailhead. Along the way you will note the tall Alexandra Palms that line the roadway. These elegant and stately 80 to 100 foot tall palms were planted under the direction of Manuel Tavares, between 1912 and 1922. 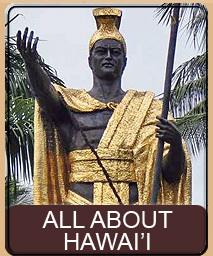 Manuel Tavares was for many years the Superintendent of Public Parks for the Big Island of Hawai'i, and is responsible for many of the plantings in public areas around the island. 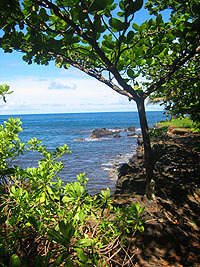 When you reach the trailhead, you will note it descends quickly on the makai (ocean) side of the road. Pass the trailhead sign and start, carefully, down the trail. 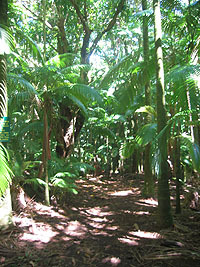 You are now descending the trail through the lush tropical overgrowth. 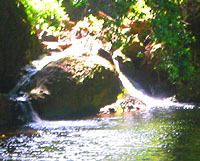 The area you are walking is separated from the Garden itself by Onomea stream, which flows year round. 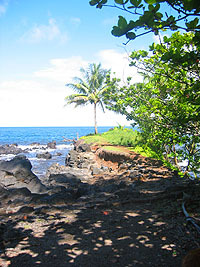 The area taken by the Garden used to be a fishing village known as Kahali'i. In the early 1800's this area became a major shipping port used to bring in materials from ships as well as taking products from the sugar mills back out to the ships. 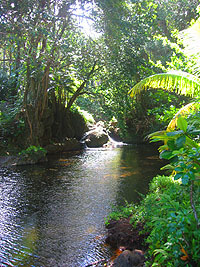 In fact, the Onomea Sugar Mill sat just behind the current Garden Visitors Center, and used the Kahali'i and Onomea streams to bring the sugar to the mill and used the trail you are walking on as a donkey trail to transport the sugar down to the boats and other material up from the boats. 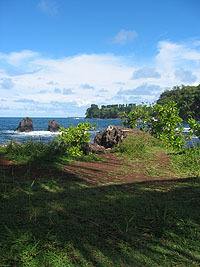 The tsunami of 1946 hit this area hard and destroyed was left of the Kahali'i village as well as changing much of the coastline. The tsunami waves in this bay reached over 35 feet above sea level, scouring the bay, shore and most of the valley. 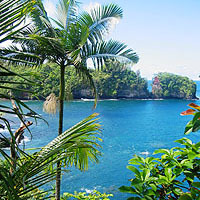 Today, very little of the village is left - basically only some walls which can be found within the Botanical Garden. By the time of the tsunami, railroads had been built which allowed goods to flow in and out of Hilo Bay. 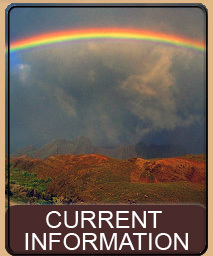 This removed the need to use Kahali'i as a port and the trail ceased to be used to transport goods and sugar. 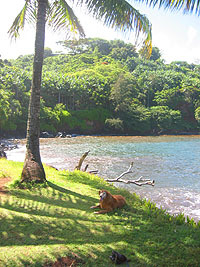 As with all sugar mills on the Big Island, the Kahali'i mill closed for good and the land now occupied by the Garden became an extensive farm providing mostly Lilikoi (passion fruit). 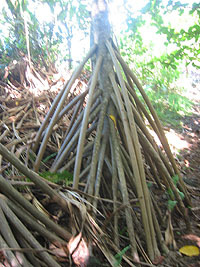 Due to the tsunami, sugar mill, and subsequent farm the plant life you see is totally non-original, having been replaced several times by man-made plantings. 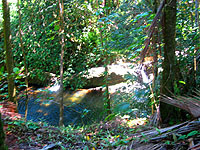 To this day you can find banana, mango and other fruits throughout this area and along the trail. As you continue down the trail, we recommend keeping a fairly good pace as the mosquitoes in this area are large enough to quickly drain you of blood - but do not fear because as you reach the end of the trail you leave the tree cover and come out into the breezy and bright bay, where the mosquitoes rarely venture (unless it's a very calm day). Near the end of the trail the ground levels out and you can see the river to your right. A number of small side trails extend from your trail (near the base) to the river. 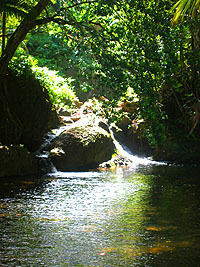 This is a popular swimming spot for local children and if you go down to the river you can see a small waterfall about 40 feet back, with a nice swimming hole in front of it (do be careful however as Hawai'i streams have both Leptospirosis as well as Giardia in them, which can enter cuts and cause major medical problems). Depending on the tide the river is either open, or closed to the ocean - making the water either cooler or warmer and more or less brackish. The riverbed is also a great place to find sea glass and old broken ceramics. Much of this is left over from the settlers in the area, as well as being brought in by the ocean currents into this shallow bay area. Continuing towards the end of the trail, we enter a very small peninsula that has the river on the right, and Onomea bay in front and to the left. You can easily see the process of erosion on the coast here, as the path narrows and has huge holes cut through it down to the water. These holes were not here a few years ago and this area is quickly returning to the ocean. Continue to the very end of the trail. There is a lone palm tree here providing nice shade and this is a great place to have a sit and soak in the beauty of the area. As you face the ocean in front of you, to your right is the Botanical Garden (and old fishing village) itself. You might see Garden visitors strolling near the base... and they will certainly see you (and wonder how in the world you got over there) - you can bet you will be on some tourist photos that they take home. 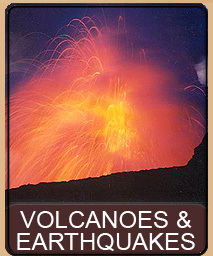 Just below the Garden, where you are facing, are a series of small lava tube caves. If the tide is just right these caves capture the waves with an impressive deep boom and a spray of water - quite mesmerizing to watch and hear. Turning to your left you can see what remains of the old and famous Onomea Arch. This well known tourist attraction remains popular to this day, with many people stopping along the Scenic Drive to take photos of where this huge arch once stood. The arch itself, having most likely survived thousands of years, had the primary portion of the arch collapse on May 24, 1956 during a heavy earthquake. 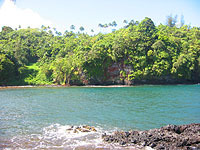 The small bay area between the arch and yourself is rich with red lava rock and dirt, and the water is brown with the constant run-off. 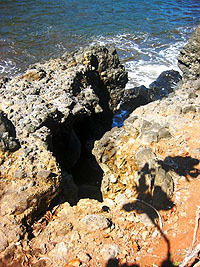 Many lava tube caves dot the far part of the cove. This is not a good swimming area (stick to the river if you wish to swim) as there is little visibility in this portion of the cove. However, this is a very popular spot for local fishermen who seem to be able to pull out many tasty treats from this particular location. 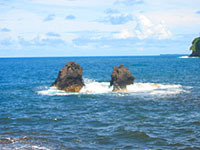 Just in front of you, between you and the ocean, are two small rocks. We might be led to believe that these rocks were perhaps recently part of the trail, but actually these rocks stand today, much as they did a hundred years ago when the Hawaiian village was here. 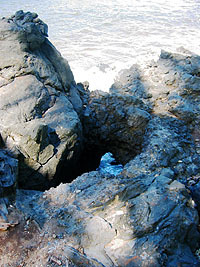 Several legends exist about the rocks including one legend that contents that the rocks were lovers who gave their life willingly to protect the entrance of the bay from attack. The Botanical Garden itself takes the entire 25 acre valley, the land which was originally purchased and developed by Dan and Pauline Lutkenhouse in 1978, and opened to the public in 1984, under much controversy. 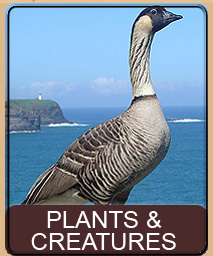 The current Garden is open to the public for a fee and contains both native and non-native plants. Featuring over 2000 species of plants the valley is a treasure trove of interesting botanical specimens and attracts plant lovers from a round the world. The controversies surrounding the original project were daunting and included problems on both sides of the fence. However, perhaps the most publicly challenging problem was allowing public access to the shoreline. Many people who frequented the area and kayaked the river complained that the river had razor wire in it, causing dangerous situations, and No Tresspassing signs were along the trail. Additionally the garden itself was found to be in fault of a number of issues causing delays and more controversy. 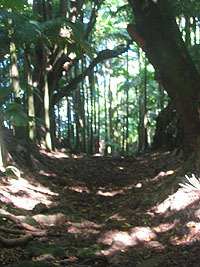 Despite changes to the trail opening it up to the public and most other issues being solved, in 1995 the Lutkenhouse finally had enough and donated the land to the current Hawai'i Tropical Botanical Garden who maintains the now, 40 acre establishment, to this day. 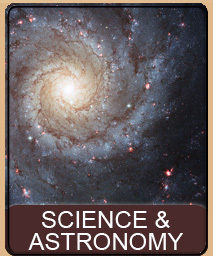 (read more here). The view from the bay is especially stunning on bright, sunny, and clear days. The water color varies from turquoise to deep blue and, near to the left shore, reds and murky browns. The bright red rock against the blue water and sky is extremely vivid. Once you have had enough of the view, it's time to hike back to your car. Simply return the way you came, huffing and puffing back up that hill. Keep a good pace and you will soon be back at the top. This page is named 'Hikes.onomea'. Can't Find It?